“Moo! Baa! Maa!” a few hundred people shout in unison over the tunes of a onesie-clad DJ, as our host prompts the chants from onstage inside an events venue dressed up with rows of exhibitor booths and a pastoral photo opp with cutout cows. The enthusiastic call and response feels like spring break-meets-motivational rally, but instead of worshipping at the altar of wet T-shirts or self-empowerment, we are here to celebrate an edible miracle of microbiology: cheese—and the people who sell it. Founded a decade ago by third-generation cheese importer Adam Moskowitz, the Cheesemonger Invitational is a bi-annual summit held in New York and San Francisco. Over the course of a weekend, dozens of mongers meet international producers, attend seminars, and advance their culinary educations. Then, they get down to business with the main event: a 10-part Olympic Decathlon of cheese selling that tests knowledge, palate, and mongering mojo. “Are there cheese rivalries?” I ask a representative from Vermont Creamery, stationed next to the Wisconsin booth in what I assume is a calculated effort to stoke the flames of a long-simmering rivalry. Wisconsin’s within earshot. I decide she must be lying. A rep in a monogrammed puffy jacket explains how the acclaimed Gruyère 1655 AOP is made using glacial waters and alpine salt. A monger from Neal’s Yard Dairy in the U.K. takes us through a progression of Kirkham’s Lancashire, the only traditional farmhouse Lancashire in the world. He hands over a sample of Montgomery’s Cheddar, a celebrity cheese that tastes like horseradish and fresh grass; nothing like the distant cousin I picked up at Safeway last week. There’s nothing snobby about the vibe, but these are serious cheese people. They sport T-shirts with the words “Beneficial Microbe.” They greet familiar cheeses like old friends. They make jokes about sanitized work stations and, yes, inevitably cutting the cheese. I like cheese, but compared to this crowd I might as well be lactose intolerant. For a brief moment sometime into my second hour of stabbing toothpicks into tiny chunks and nodding sagely, I reach full cheese capacity. This is too much cheese, I think. Then I smack myself, grab a cracker and keep eating. The competition, however, is no picnic. Cheesemongers are the sherpas of the cheese world, benevolent guides who must cultivate an encyclopedic knowledge of the wedges and wheels on their counters so they can help customers pick just the right goat gouda or funky washed rind. If you want to expand your cultured horizons, befriend your local cheesemonger. And quit being a weenie. To make cheesemongering a competitive sport, CMI breaks the work of a monger down into its basic elements, testing each over the course of 10 different events. There’s a written exam on the science of turning milk into Morbier or Mimolette, a cutting test to slice a perfect quarter pound, two separate wrapping rounds, and a mock salesmanship scenario. Three weeks before they arrive, each monger is also assigned a trio of cheeses with which they must create a perfect pairing, a perfect slate, and a perfect composed bite. Finally, they must identify an array of aromas and complete a blind tasting, naming each cheese, its milk, and whether it’s raw or pasteurized. If you can identify a cheese’s particular aromas and flavor notes—calling out Sbrinz’s brown-buttered popcorn rather than general nuttiness, says Matt DeLoach, a competitor from Harmons Neighborhood Grocer in Utah—you can guide an open-minded eater towards a new discovery. Jill Zenoff, the 2019 Cheesemonger Invitational champion. The theme to Rocky starts blasting inside the Cheesemonger Invitational, and it’s time for the finals, a field of 37 whittled down to six who will compete in front of a raucous crowd. The mongers introduce themselves and their superstar cheeses, then move on to a trivia round and a wrapping contest, where they have 30 seconds to origami as many wedges as possible into neat paper bundles sealed with a sticker (never plastic wrap, which makes cheese sweaty). “She’s using the French pleat!” host Jonathan Richardson screams as one competitor rolls and folds. 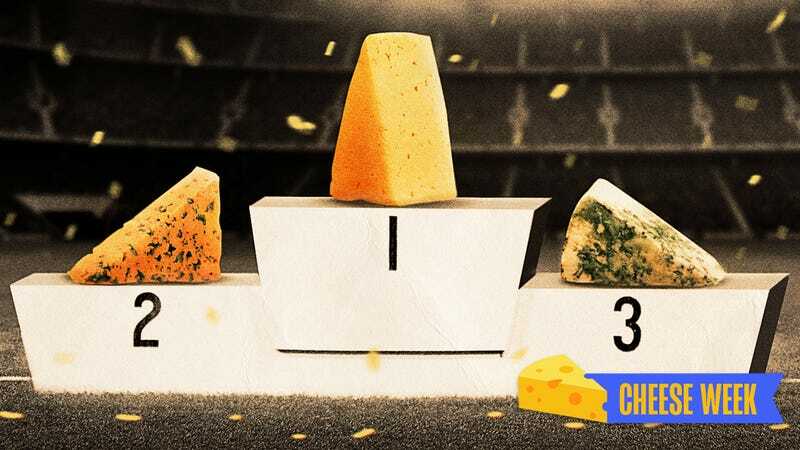 In the perfect cut competition, each monger picks their weapon of choice and then given one frantic minute to slice as many quarter pounds as possible from a wheel of mystery cheese, using only their chosen implement and cheesemonger’s intuition. Eyeballing a perfect quarter-pound is excruciatingly tough, and the crowd’s emotions rise and fall as each chunk hits the scale: .20, .18, .30. At .24, there’s a collective groan. When the scale reads a perfect .25 the audience explodes in cheers, myself included. Slicing cheese makes a shockingly good spectator sport. Nobody scores more than one. When the judges have tallied the cumulative scores, the room gets quiet for the first time all night, and it’s time to announce the winner: The 2019 Cheesemonger Invitational Champion is Jill Zenoff, the CMI rookie from Cowgirl Creamery. How long will the cheese last tonight? Can any human being tell me if I should eat this rind? Soon lighters are in the air, and I’ve joined the hundreds of curd nerds hopped up on Comte and Caveman Blue singing along as Zenoff strums. There are no rivalries at cheese camp, and tonight we’re all cheese people.